Shown holding their plaques for the Four County Career Center Wall of Fame/Distinguished Service Award are, from left, William J. Spiess, Lori Deem, Todd Henricks, Tiffany (Dennie) Kennerk, Bradley E. Mangas, Shelly Reagle, and Gregory C. VanDyke. 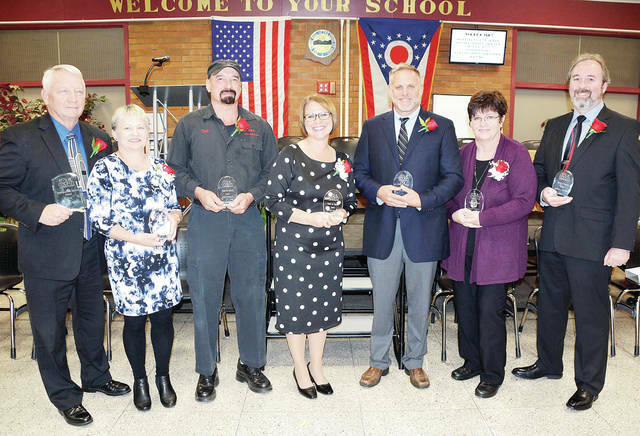 Four County Career Center in Archbold celebrated its 50th anniversary by hosting an open house and celebration program combined with the annual Wall of Fame/Distinguished Service Award inductions honoring its history, students, and staff – both former and present – during the program. Former superintendents Dr. David Nicholls and William J. Spiess both spoke at the event of the support and success of FCCC over the years. Proclamations were made by Ohio House of Representatives members James Hoops, Derek Merrin, and Craig Riedel. The Ohio Senate was represented by Senators Robert McColley, and Randy Gardner. Governor John Kasich sent a proclamation recognizing FCCC’s 50 years of service to northwest Ohio. Fifth District Congressman Robert Latta presented the school with a proclamation from the U.S. House of Representatives and a U.S. flag that flew over the nation’s Capitol. FCCC’s Fifth Annual Distinguished Service Award was given to former superintendent Spiess. The award is traditionally presented to the individual who has displayed on-going dedication and commitment to FCCC and to the communities it serves. Spiess retired as superintendent in 2012, after 38 years in education. He has continued to be active in many educational and community organizations following retirement, and is a member of the FCCC Endowment Committee. Lori Deem, a Hicksville High School graduate who enrolled in the FCCC Data Processing program, from which she graduated in 1984. Lori is currently owner of Deem Insurance Agency, LLC in Jonesville, Mich.
Todd Henricks, who enrolled at FCCC from Edgerton High School, entered the Small Engines program, and graduated in 1981. He is the owner of Todd’s Auto Collision and lives in Bryan. Tiffany (Dennie) Kennerk attended FCCC from Edon High School and graduated in 1997 in the Health Occupations program. Tiffany is currently the Medical-Surgical Director of Nursing at the Community Hospitals and Wellness Centers in Bryan. Bradley E. Mangas, an Ayersville High School graduate, entered the Machine Trades program at FCCC and graduated in 1987. He is currently the owner/operator of B.E. Mangas and Son, LLC and Buffalo Wild Wings of Northwest Ohio. He resides in Defiance. Shelly Reagle enrolled at FCCC from Fairview High School and graduated in 1972 in the Cosmetology program. She is owner of N.L.S. Hair Boutique in Ney and she lives in Sherwood. Gregory C. VanDyke attended from Fairview High School, entered the Drafting and Design program, and graduated in 1985. He is currently the owner of Culligan Sales and Service of Northwest Ohio in Bryan and lives in Hicksville. A picture/plaque of each Wall of Fame and Distinguished Service Award recipient will be placed in the main entrance at the school. https://www.fcnews.org/wp-content/uploads/sites/45/2018/10/web1_FCCC-50th-Anniversary.jpgShown holding their plaques for the Four County Career Center Wall of Fame/Distinguished Service Award are, from left, William J. Spiess, Lori Deem, Todd Henricks, Tiffany (Dennie) Kennerk, Bradley E. Mangas, Shelly Reagle, and Gregory C. VanDyke.